The mahogany webworm, Macalla thyrsisalis Walker, is a moth species whose caterpillar defoliates West Indies mahogany, Swietenia mahagoni Jacquin, in Florida. The strikingly colored caterpillars and their extensive webbing often attract the attention of southern Florida residents during the spring. The mahogany webworm has been reported in southern Florida, Grand Bahama (an island of the Bahamas), Hispaniola, southern Mexico, Central America, Trinidad and near the Amazon delta in Brazil, which suggests this species is probably distributed throughout the range of Swietenia spp. in the Americas. The moth of the mahogany webworm has a dull, brown body. The forewings are the same color, with indistinct bands. In nature, the resting moth usually extends its forewings posteriorly with the hind wings beneath them. The dorsal surface of the hind wings, easily seen in spread specimens, is off-white with brown outer margins. The lower surfaces of both forewings and hind wings are off-white with thin brown margins. The antennae are filiform, which is a typical thread-like form of antennae in Pyralidae. Figure 1. An adult mahogany webworm, Macalla thyrsisalis Walker. Photograph by F.W. Howard, University of Florida. 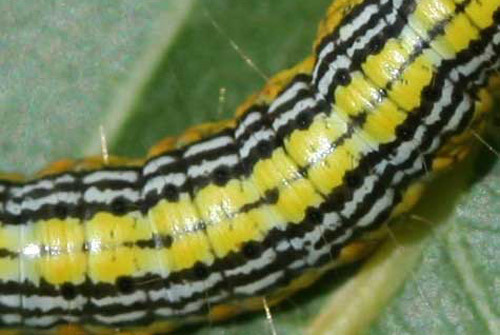 The larva is colorful, with a deep yellow ground-color and lateral bands that consist of three narrow, black stripes alternating with two white stripes. An intermittent black line runs dorsally when the caterpillar is extended. This appears as a continuous line when the caterpillar contracts. The head is black with a brown labrum and mandibles. A white band along the anterior margin of the prothorax appears as a white collar. The six thoracic legs are black. As in typical Pyralidae and most other families of Lepidoptera, abdominal segments 3, 4, 5, 6 and 10 bear prolegs. Figure 2. The larva of the mahogany webworm, Macalla thyrsisalis Walker. Photograph by F.W. Howard, University of Florida. Figure 3. Lateral view of section of abdomen of larva of the mahogany webworm, Macalla thyrsisalis Walker, showing distinctive black and white lateral band. Photograph by F.W. Howard, University of Florida. Figure 4. Close-up dorsal view of larva of the mahogany webworm, Macalla thyrsisalis Walker, showing intermittent black medial line. Photograph by F.W. Howard, University of Florida. Figure 5. 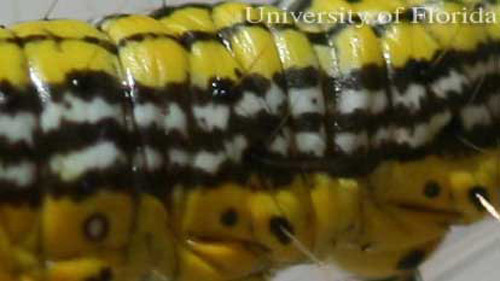 Close-up dorsal view of larva of the mahogany webworm, Macalla thyrsisalis Walker. Note white anterior margin of prothorax and continuous dorsal medial line when caterpillar is contracted. Photograph by F.W. Howard, University of Florida. The adult moths fly in spring. Eggs have been obtained in the laboratory, but not seen in nature. They are probably oviposited on the foliage of the host tree. Presumably the young larvae eat the shell of the egg from which they hatch, a common behavioral trait in Lepidoptera. The larvae are solitary and each one spins a web to pull several leaves together and consume leaves from the leaf margins inward. The larval activity coincides with the period of spring flush and leaf expansion, and the larvae feed primarily on young leaves before they have matured. The larval stage is completed in about 10 days. Figure 6. 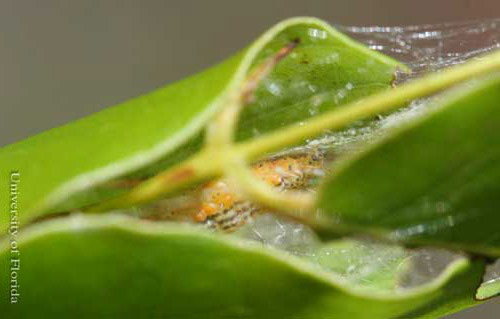 A mahogany webworm larva, Macalla thyrsisalis Walker, in its webbing. Photograph by F.W. Howard, University of Florida. Figure 7. Leaves of West Indies mahogany, Swietenia mahagoni Jacquin, tied together by a larva of mahogany webworm, Macalla thyrsisalis Walker. Photograph by F.W. Howard, University of Florida. 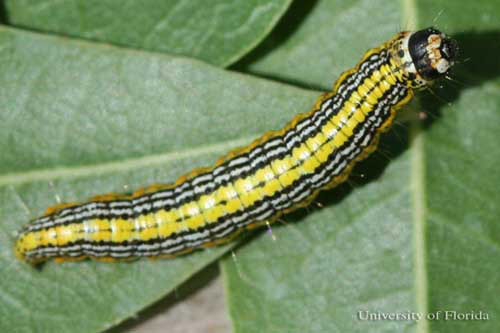 The mature caterpillars descend from the trees by ballooning, then crawl beneath objects or penetrate leaf litter or the upper surfaces of the soil. They enter a prepupal stage for five to seven days during which they build cocoons. The pupal period has been observed to last 18 to 20 days, but there are some indications that the pupal period may be extended in some individuals. 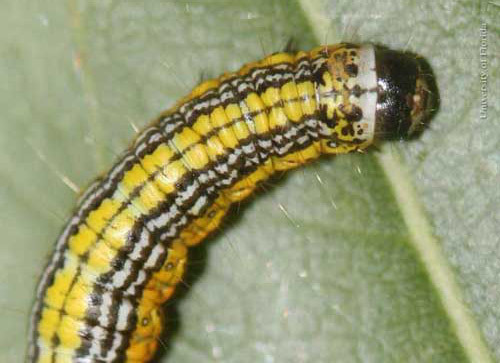 The populations of larvae decline after the spring leaves mature. Populations of adults and larvae are concentrated in the spring when the larval food source is available, which suggests an inactive stage in the life cycle, perhaps as pupae. This would allow the population to survive from spring to spring without feeding. Figure 8. 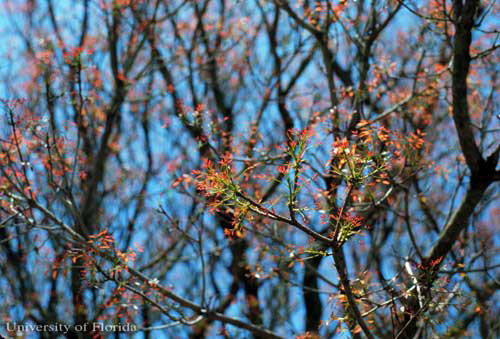 Young spring foliage of West Indies mahogany, Swietenia mahagoni Jacquin, has a reddish color. Photograph by F.W. Howard, University of Florida. Figure 9. Mature foliage of West Indies mahogany, Swietenia mahagoni Jacquin, is deep green in color. Photograph by F.W. Howard, University of Florida. Figure 10. Cocoon of the mahogany webworm, Macalla thyrsisalis Walker. Photograph by F.W. Howard, University of Florida. In Florida, the mahogany webworm attacks only West Indies mahogany, Swietenia mahagoni. Both the tree and insect species are native to this region. The larvae will feed and develop on the foliage of some other species of Meliaceae if placed on it, including Honduras mahogany (Swietenia macrophylla King), Nyasaland mahogany (Khaya anthotheca (Welw.) C. DC) and tropical-cedar (Cedrela odorata (L).). The latter are not native to Florida but are occasionally grown here as specimen trees. Honduras mahogany is distributed on mainland Tropical America from Mexico and Central America through the tropical regions of South America. Throughout its range, Honduras mahogany is sympatric with tropical-cedar. However, the range of tropical-cedar extends beyond that of Honduras mahogany into the West Indies and further into South America. One or both of these are presumably the hosts of the mahogany webworm on the mainland of the American Tropics from Mexico to Brazil. The fact that in Florida the mahogany webworm does not attack these plants suggests it may be different genetically from the species currently recognized as Macalla thyrsisalis elsewhere in Tropical America. Figure 11. West Indies mahoganies, Swietenia mahagoni Jacquin, at the University of Florida Fort Lauderdale Research and Education Center. Photograph by F.W. Howard, University of Florida. Mahogany webworm consumes the leaf tissue of its host plants. 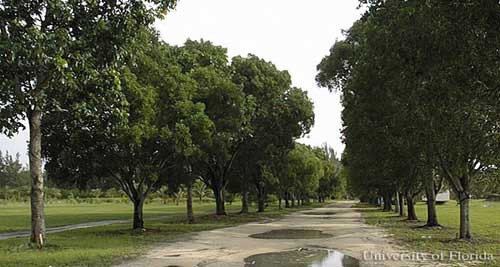 During much of the 1980s and early 1990s, outbreaks of this insect occurred each spring in southern Florida, and the insects stripped the foliage of many West Indies mahogany trees. 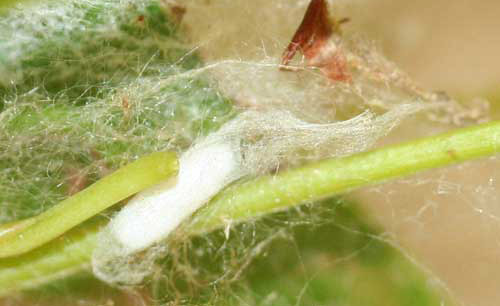 However, most defoliated trees quickly flushed new foliage, which remained free of webworms for the rest of the duration of the growing season. It is doubtful that the spring defoliation, even when extensive, has an effect on health and growth of West Indies mahoganies of significance for shade trees. The most objectionable aspect of this pest is the aesthetic damage. Trees stripped barren by insects and shrouded in webbing incorporated with frass and dead leaves are an unpleasant sight. Additionally, large populations of the caterpillars become bothersome when they mature and drop from the trees and search for pupation sites. They cover sidewalks and driveways and sometimes enter houses. Since the late 1990s, mahogany webworms have been present on West Indies mahogany trees each spring, but in light populations that are scarcely noticed by the general public. Mahogany webworms sometimes attack young mahogany trees in nurseries, but they are usually not thought of as important nursery pests, probably because their presence is very transitory and they are easy to control under nursery conditions. They have not been reported as pests of mahoganies in natural forests or in plantations. where mahoganies are grown as timber. In southern Florida and presumably throughout its native range, the mahogany webworm is under natural control. One parasitic fly species, Lespesia n. sp. (Diptera: Tachinidae) and two species of parasitic wasps, Habrobracon sp. and Apanteles sp. (Hymenoptera: Braconidae), are natural enemies of mahogany webworm in Florida. 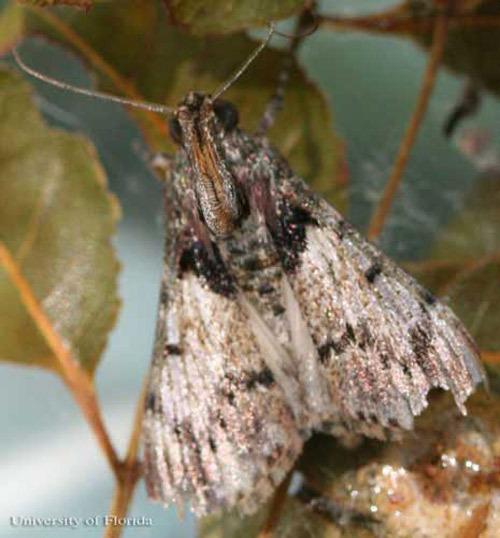 The outbreaks of mahogany webworm in southern Florida mentioned above may be in part associated with cyclic declines in populations of natural enemies. Figure 12. 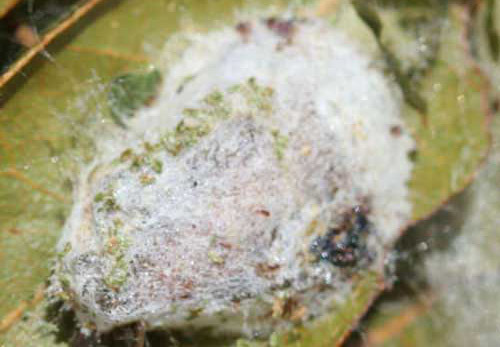 The cocoon of a hymenopterous parasitoid of the mahogany webworm, Macalla thyrsisalisWalker. Photograph by F.W. Howard, University of Florida. Various insecticides were found to be lethal to mahogany webworms under laboratory conditions, but spraying large trees, whether in urban or rural areas, may involve health and environmental hazards. 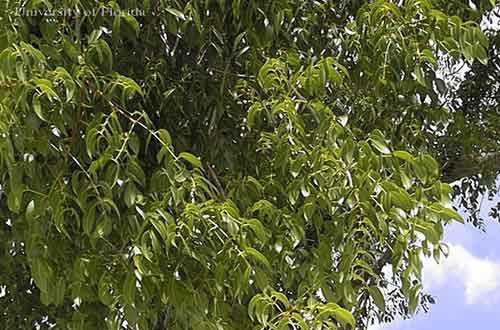 Spraying mahogany foliage with a neem product, which is a safer option, was found to be effective in preventing mahogany webworms from consuming foliage when applied just before the appearance of larvae in the spring, or when they were in early instars. Howard FW, Solis MA 1989. The distribution, life history and host plant relationships of mahogany webworm. Florida Entomologist 72: 469-477. Publication Date: July 2006. Latest Revision: November 2015. Reviewed October 2018.